Burma's military junta has confirmed that it has begun moving parts of the government to a new jungle location. Information Minister Brigadier General Kyaw Hsan said nine ministries had begun the move to Pyinmana, 600km (373 miles) north of Rangoon. 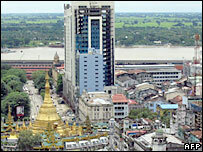 He said that a more strategic location was necessary for Burma's government. "The authorities have chosen Pyinmana because it is centrally located and has quick access to all parts of the country," Brig Gen Kyaw Hsan said. It is the first time the Burmese military junta has acknowledged the move is under way. There were reports on Sunday morning of convoys of trucks laden with personnel and equipment leaving Rangoon. Pyinmana has been the pet project of the military government for many years. But according to a BBC correspondent in Bangkok, construction is thought to have begun in earnest only 12 months ago. It is believed the compound, which occupies 10 sq km (4.6 sq miles), is designed to include homes for military leaders, diplomatic quarters, a parliamentary building, an airport, golf course and other buildings to accommodate the bureaucrats. One of those who arrived on Sunday told the French news agency AFP that people had to spend the night on the floor, and had been told they would only receive meals for the next two days. The reasons for moving the capital are unclear, our correspondent says. Some analysts point to a paranoia among senior military figures that they might come under attack, potentially from the United States, and that a location further from the coast is strategically safer. It certainly puts the generals closer to their frontline forces within the Shan, Chin and Karen states, our correspondent says. But others suggest the military leaders are simply repeating the habits of the Burmese kings in pre-colonial times who built new towns and palaces on the advice of fortune tellers.